With good brushing and flossing at home and regularly scheduled dental checkups, your teeth just may last a lifetime. However, there are some circumstances that call for tooth extraction in Greenfield. If you have a tooth that must be removed, then you can relax knowing your dentist will perform the procedure with skill, compassion and attention to your safety and comfort. What Situations Call For Tooth Extraction? There are several reasons why a dentist in Greenfield may recommend tooth extraction. One is tooth decay. A tooth with a large cavity may be too severely damaged for repair with a filling, inlay, onlay or dental crown. When this happens, tooth removal is necessary to prevent the spread of infection and to eliminate any discomfort or pain that a large cavity can cause. 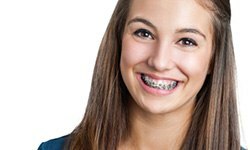 Another common reason for tooth removal is to prepare for orthodontic treatment. In this case, extracting one or more tooth can help create enough space for adjacent teeth to move into proper alignment. Lastly, if advanced periodontal disease has destroyed gum and bone tissue, then there may be loose teeth that can only be extracted and not preserved. How Does the Dentist Remove a Tooth? First, you’ll receive a local anesthetic to numb the tooth and surrounding soft tissue and bone. Once this takes affect, the extraction process begins. Keep in mind—you may feel pressure, but you should not feel any pain. If possible, the tooth will be extracted using applied pressure to the socket and dental forceps. This method is often possible with a tooth that is fully erupted. However, when a tooth is in impacted and has not broken through your gums—as can be the case with wisdom teeth—then the dentist may need to surgically divide the tooth and remove each section individually from the underlying bone. What About Recovery from Tooth Extraction? Some bleeding and swelling after tooth extraction is perfectly natural. Usually, gently biting down on a clean pad of gauze will stop the bleeding. If you’ve had wisdom teeth or other molars removed, then a few stitches may be needed. You can reduce discomfort and swelling by placing an ice pack on your cheek for 20 minutes on and then 20 minutes off. Don’t touch the extraction site, but do keep it clean. After 24 hours, you can swish with saltwater or a medicated rinse. Let the solution dribble out of your mouth and don’t spit. Eat soft foods and shift chewing to other areas in your mouth.